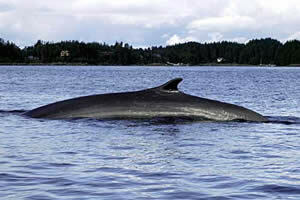 The fin whale received its name due to the prominent fin on its back, near the tail. Other names for this whale are Finback, Common Rorqual and Razorback. These streamlined whales have long, sleek bodies with small flippers and a v-shaped head that is flat on top. Each side of the whale is different in color. The underside, right lip and baleen plate are yellow-white. The main body, left lip and baleen plate are light gray. The narrow, long body makes among the fastest swimmers with bursts of speed up to 17 miles per hour. Where To See Fin Whales in Alaska! These great whales prefer temperate and arctic waters. Whale watchers can see them all along the Alaska coastlines including the Aleutians, Inside Passage and Prince William Sound. Fin whales travel in the open waters, away from the coastlines, which makes their migration paths difficult to track. Most migrate from their arctic summer feeding areas to more temperate winter breeding grounds. Fin Whale in Southeast Alaska. Fin whales lunge into schools of small fish with their mouths wide open. They also skim the water eating herring, capelin, sand lance, and krill. A fin whale may eat two tons of food every day. Fin whales are loners or sometimes found in small groups. Large, temporary groups of whales concentrate on feeding grounds. Fin whales can be see swimming with blue whales. Fin whales are social when together in large groups, making pulsing sounds with their jaws while feeding as a way of communicating within the group. They also produce splashing crashes when they breach. Grunts and moans are other vocalizations heard from this whale. Humans have heard these calls at distances of 125 miles from the calling fin whales. Young, sick or very old fin whales fall predator to attacks by Orca (Killer whales). The fin whale is also fatally susceptible to a parasite. There are estimates that between 14-18 thousand fin whales are in the north pacific. Length: 69 feet for males and 74 feet for female. Weight: 40 to 80 tons. Travel speeds: up to 17 miles per hour with average speeds of 5-6 knots. Typical submersion times: as long as 15 minutes although most dives average 6-15 minutes. Habitat: Fin whales live throughout the world's oceans. Diet: herring, other small fish, and euphausiids (krill). Conservation Status: Protected, The International Whaling Commission (IWC) gave them worldwide protection status in 1966. Listed as endangered under the U.S. Endangered Species Act in 1973. Fin Whales in Alaska can be spotted all along the Alaska coastlines including the Aleutians, Inside Passage and Prince William Sound. Here on Whale Watching Alaska you will find information on Alaska whale populations, distributions and over all health. Promotes environmentally responsible whale watching trips featuring gray whale, killer whale, humpback whale, beluga and whale pod photo. Numbers obtained from the Alaska Dept. of Fish and Game and Noah.